Liverpool are reportedly plotting a last-ditch attempt to lure Alex Oxlade-Chamberlain to Anfield. The England international had a top season with Arsenal last term as he contributed six assists and 11 goals en route to their FA Cup triumph. The 23-year-old initially started the campaign on the flanks, but he was later drifted into a central midfield role before taking up an unfamiliar wing-back position in the backend of the season. Oxlade-Chamberlain has been a favourite among the Gunners faithful since his arrival from Southampton back in 2011, but he has not realised his full potential with Arsene Wenger opting to chop and change his attacking options. However, The Ox managed to prove his credentials during the recently concluded campaign as he showed a tireless work rate and the hunger to win games for the club. 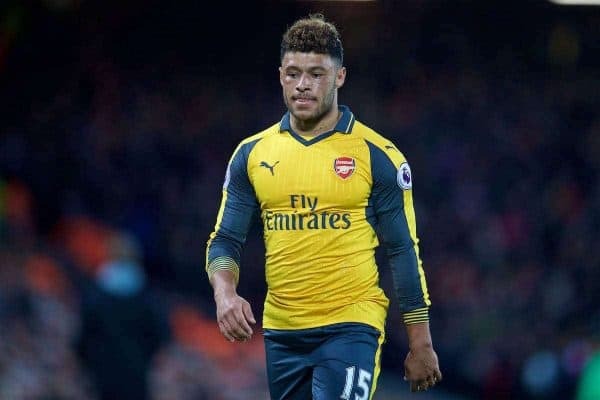 While The Ox remains committed to extending his stay at the Emirates, the Reds are nevertheless eyeing a potential swoop for his services with the promise of playing him in his preferred central midfield role, The Express reports. The former Saints graduate has been a huge fan of Steven Gerard over the course of his playing career, and he is keen to replicate the former Reds legend at the heart of the midfield. Oxlade-Chamberlain has become a regular feature in the Three Lions squad thanks to his good showing last season, and it will be interesting to see how he reacts to the transfer interest with Arsenal prepared to offer him a £100,000 weekly wage in order to prolong his stay. Jurgen Klopp’s side are planning a club-record bid of around £40m to tempt the Gunners into the potential sale of a player, who has just a year left on his existing deal and is likely to leave. This entry was posted in Liverpool Fan's Blog and tagged Andy Carroll, Atletico Madrid, Chelsea, Daniel Agger, Daniel Sturridge. Bookmark the permalink.